Launched as Rainbow on 17 November 1898, many referring her design heritage to the Britannia model after the GL Watson designed cutter for the Prince of Wales, which had been performing spectacularly well since launch in 1892. After some tune up races in Auckland, she was shipped to Sydney on the Waihora in mid January 1900 where she was raced by Pittar and his regular Auckland crew, with the addition of Arch Logan, and several local Sydney sailors. Rainbow beat a Fife designed White Wings by large margins in warm up races after arriving in Sydney. The Intercolonial race began badly when Rainbow broke her bowsprit in a collision before the start, but was sportingly given an hour to make repairs. A mizzen boom from another yacht was rigged as a replacement. Despite the handicap of hasty repairs, Rainbow managed to win the Intercolonial race on both line and handicap. Meanwhile after Pittar attempted unsuccessfully to sell Rainbow in Sydney and she returned to New Zealand the conquering hero. In December 1900 she sailed to Lyttleton where she won the Canterbury Jubilee Regatta, and then onto Wellington to win the Wellington Anniversary Regatta in January 1901, where she was sold, but returned to Auckland the following year. While in Wellington her presence was responsible for local yachtsman Alexander Turnbull placing an order for a yacht to beat Rainbow and her sister Iorangi was born, which she has been racing ever since. 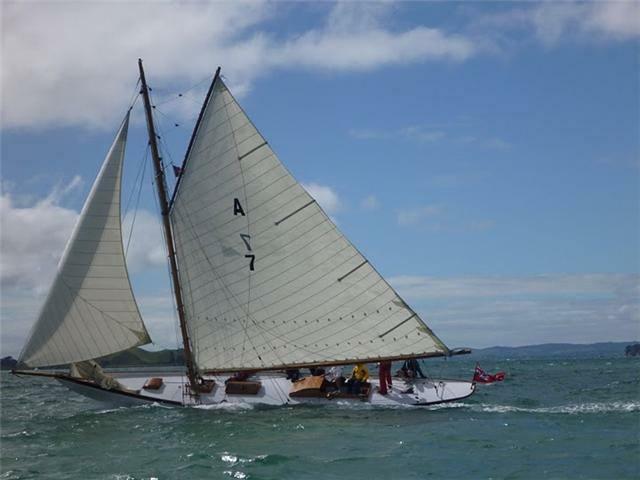 Rainbow was one of the first New Zealand yachts to race successfully overseas. Rainbow is part of an unbroken chain of successful yachts establishing New Zealand yachting on the international stage and which captured the imagination of the general public: Akarana , Meteor, Rainbow , Matara, Komotu, Rainbow II, Steinlager II, Enza, Black Magic, and has since her launch been considered by authors and commentators to be the most beautiful of all the Logan creations. Rainbow is a flush deck gaff cutter with 50ft on deck, 34ft on the water, 9ft beam and 6ft 2in draft carvel constructed of triple skin Kauri. She has sailed under the A 7 sail number since permanent sail numbers were allocated in 1921.